Heidi Now As A Bracelet! Hello! How are you doin’ this week? Have you been hangin’ out during my FB live chats? 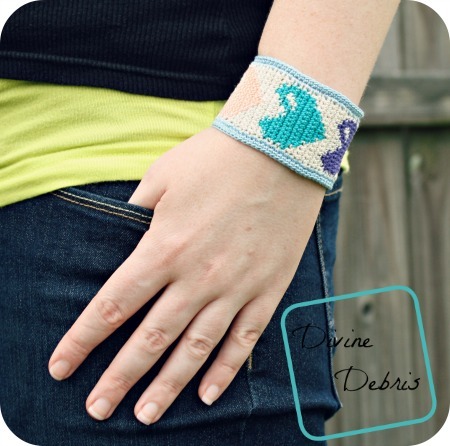 Because last week I showed off the Heidi Bracelet and a coffee cup coaster design I made and asked the viewers which they’d like to see on the blog and there was overwhelming support for the Heidi Bracelet… so here it is! The design for this like the scarf of the same name, but with a little stylized bit on the top of the heart. I’m still lovin’ tapestry and I hope you are too because there will be more and more coming your way! 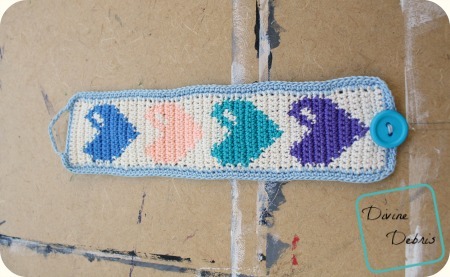 This pattern is worked in parts, the base of the bracelet, and then a border. At the end you top it off with a button. I usually work over yarn when I’m graphing but for this design I didn’t all the way through, just in the hearts I crocheted over Color A. You can do whatever you feel comfortable with. This pattern is worked in rows, back and forth, with a turn at the beginning or end. Color A is tan and color B is all colors other than tan. Every stitch in the sides portion of the pattern is a single crochet, because of this the instructions only tell you what color (ie: Color A, Color B, etc…) and the number in the parentheses then tells you how many single crochets to make. Note: You do not work into the ch-1 spaces at the corner for row 16. Row 61: Ch 1, sc into the first st, sc into the next 2 sts, ch 12, skip the next 9 sts, sc into the next 3 sts, ch 1 at the corner, rotate the piece to the right, sc into the next 59 sts, ch 1 at the corner, rotate the piece to the right, sc into the next 15 sts, ch 1 at the corner, rotate the piece to the right, sc into the next 59 sts, ch 1 at the corner, rotate the piece to the right, slip st into the first st to secure – 139 scs, 4 ch-1 spaces, 1 ch-12 space. 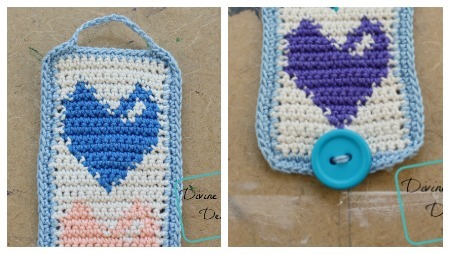 Make the right side is facing up and attach a button on the end of the bracelet opposite the end that has the ch-12. I like to weave the thread through the button holes a few times to make sure the button is super secure. 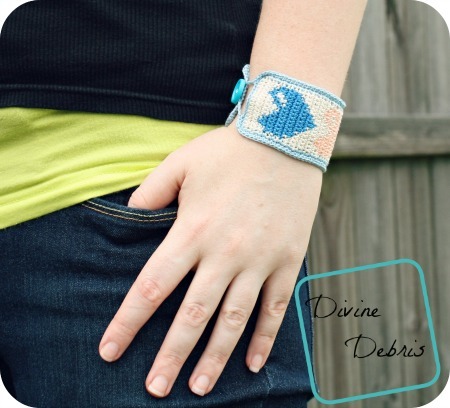 The ch-12 space wraps around the button and that’s how you keep the bracelet on your hand.